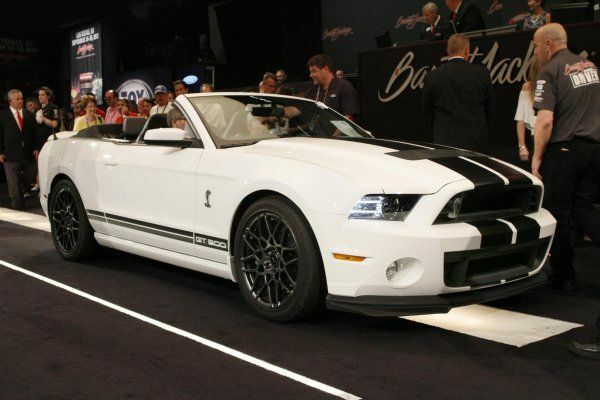 The last of the retail 2014 model year Shelby GT500 convertibles to be made was auctioned for charity and brought far more than its sticker price, a cool half million dollars from a guy in Kansas. This last weekend, the Barrett-Jackson auctions in Reno, Nevada included a special from Ford, benefiting a charity close to its race legend Parnelli Jones. At auction was the as-yet-unmade and last production run car for the 2014 Ford Shelby GT500, which will be fully customized for the auction winner and signed by Jones personally. The car, represented by a factory model 2014 GT500 on the auction floor, is one of the hottest sports cars on the market right now. Jones, who won the 1963 Indy 500, is a proponent of the Brain Injury Association of America after his son Page Jones, whose promising race career was cut short by serious injury in a wreck, got the help he needed thanks to the association. Cheering on the competition, Jones helped push the price well past its sticker mark and all the way up to half a million dollars ($500,000). We first got wind of the monumental auction offering last week (read that here). Not only is this collectible car going into the garage of someone who will definitely love it, given the price paid, but the money is going to benefit a charity whose contributions to the medical needs and awareness of brain injuries is unmatched. The winner of the auction was Don Damon of Great Bend, Kansas, who won out after a spirited bidding war over the car settled. All of the proceeds go to the Brain Injury Association of America, with Barrett-Jackson waiving auction fees as well. To add to the great event, Parnelli Jones was teary-eyed when he also announced that it was his 80th birthday and he could not think of a better present. "We worked hard to help Page recover from his injury, but we couldn’t have done it alone. We received help from the BIAA, and this funding will aid so many others who have suffered from similar injuries." Mr. Damon bought not only an icon, but also a fully custom ride that will be capable of zero to sixty times under four seconds thanks to a 662 horsepower punch. The car will be delivered before the end of the year. A hell of a Christmas present he bought himself. Eh?